On this date in 1783, London’s colorful penal history moved across town. 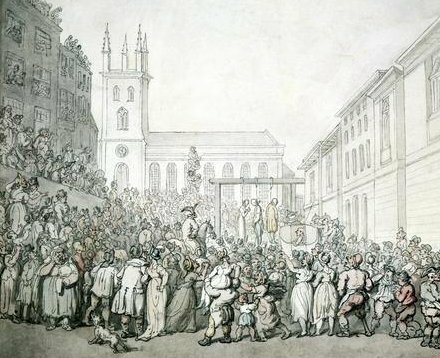 For centuries, public executions had been carried out at the storied Tyburn gallows, a ribald, rambunctious affair that involved carting the doomed from Newgate Prison through teeming city streets, by way of ale house pit stops. The Tyburn era drew to a close late in the 18th century. Five weeks before, its last victim swung there. 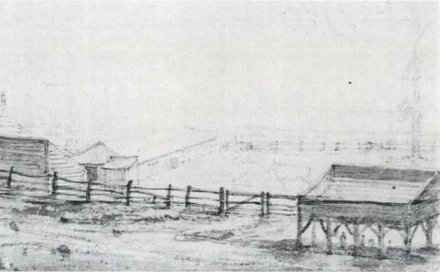 The former hanging grounds of Tyburn, sketched by William Capon in 1785. The gallery still standing was privately erected, to sell tickets to spectators eager for a view. Little more than a month later, the curtain raised and the trap fell on a new chapter for the London hanged. Henceforth, the processional would be dispensed with, and the condemned simply walked across a courtyard and up a flight of stairs to a public gallows just outside the prison. But it marked a move towards, if not altogether to, a version of the death penalty more familiar to modern eyes. For one thing, the prison itself became the site of punishment, absent the elaborate and occasionally dangerous theater of the trip to Tyburn; at Newgate, they were regularized, an extension of the frightful dungeon, and as the crowd itself was controlled and separated from the elevated platform, the natural next step would be at last to withdraw inside the prison’s walls. At the same time, there is a technological advance towards “scientific” hangings geared to minimize suffering: the ‘New Drop’. This system, whereby a trap sprung beneath the prisoner’s feet suspended him on the gallows, was not strictly new — a form of it had been used at Tyburn as early as 1760, though not repeated. * But the new drop (still just a variety of short drop, where strangulation is likely) marks a distinct shift towards a mechanistic punishment, clearly removed from the sometimes fraught physical confrontation between a prisoner and a hangman attempting to force him or her from the cart, and an antechamber into the grim 19th century science of reckoning hangman’s drops for the precise effect of snapping (without severing) the neck. Of course, progress always has its detractors. [T]hey object that the old method drew together too many spectators. Sir, executions are intended to draw spectators; If they do not draw spectators, they don’t answer their purpose. The old method was most satisfactory to all parties; the public were gratified by a procession and the criminal was supported by it. 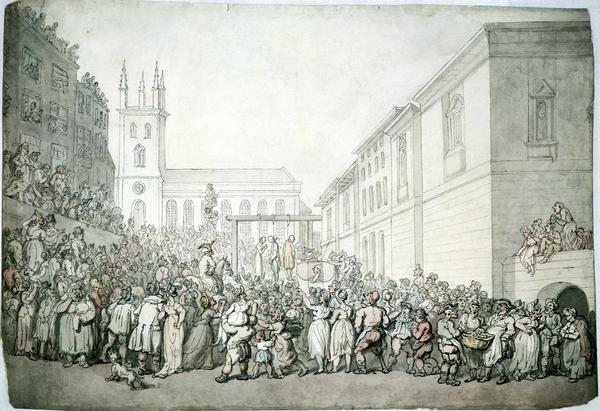 was not adopted as the general mode of execution till 1783, when ten felons were executed on the 9th of December in that year for the first time in front of Newgate, on a new drop or scaffold hung with black … The gallows used at Tyburn was purchased by a carpenter who, having no sentiment in his composition, converted it into stands for beer butts in the cellars of a public house called the “Carpenter’s Arms” in Adam Street.